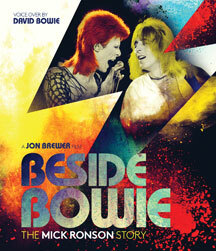 With exclusive voice-over contributions from David Bowie, this film is a celebration of the life and works of guitar virtuoso Mick Ronson, a rock hero virtually uncelebrated despite his direct contribution and involvement in countless compositions, lyrics and recordings that changed the face of music forever. An Emperor Media Ltd production, documentary special Beside Bowie: The Mick Ronson Story(101:50 minutes) is from award-winning producer/director Jon Brewer. Mick Ronson’s humble beginnings in Hull, England underpinned his values and modest, unpretentious personality as he worked with the city’s council whilst pursuing his craft with consummate dedication. Click HERE to view an interview with director Jon Brewer.